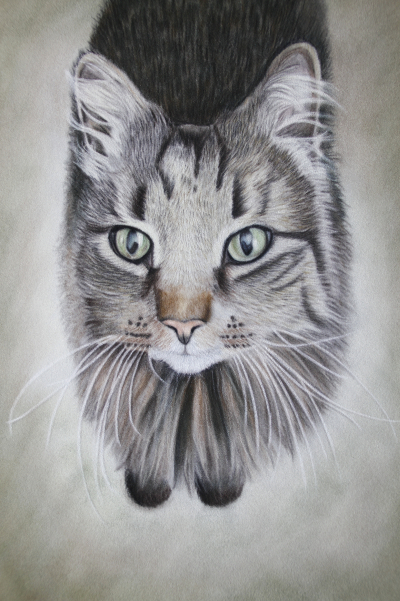 A custom cat portrait in soft pastel is a beautiful object to behold. It will hang on your wall and you will view it with pride every time you walk past. Because I use artist quality soft pastels it will last a life time. I’m a big cat fan. I always said that when I bought my first house the first thing I would buy for the house would be a cat. It turned out that the couple we bought the house from were leaving for Spain. They didn’t want to take their cat! We ended up buying a very expensive cat that came with a free house. 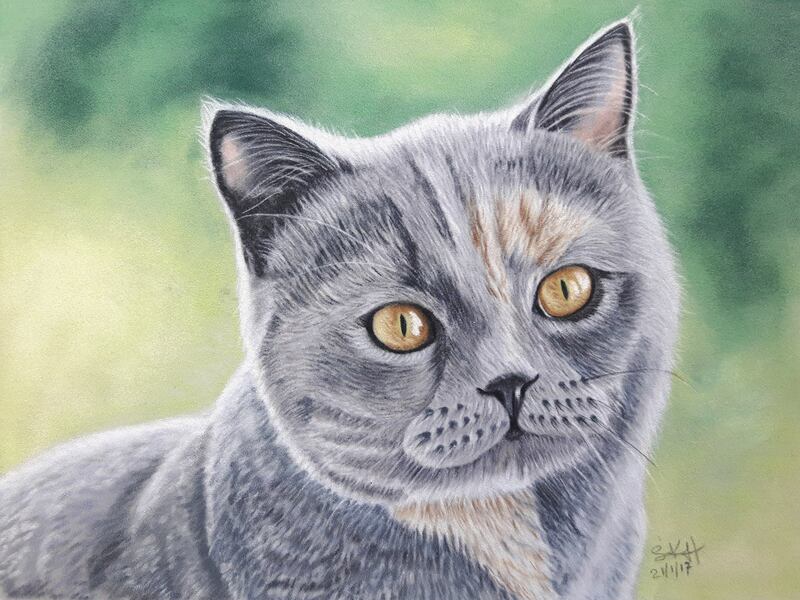 This is a recent custom cat portrait I did of a cream and blue British Short Hair kitten called Gracie. Gracie was sat in a window which gave such vibrant lighting on her coat. The background is a beautiful bokeh (out of focus ) effect. Gracie is currently adorning the front of my leaflets that are at the Happy Cats Cattery in Winsor. I used a number of photos to get Gracie’s colouring and guidance from her owner in the final stages. Even quality photos don’t always pick up the correct colouring. To get a truly perfect custom cat portrait I always ask my clients about the colouring and never solely rely on the judgement of the camera. A Custom cat portrait can be any size but as cats are generally small creatures a head portrait could be 8x8 inches. A full body 8x12 inches which is roughly A4 size. 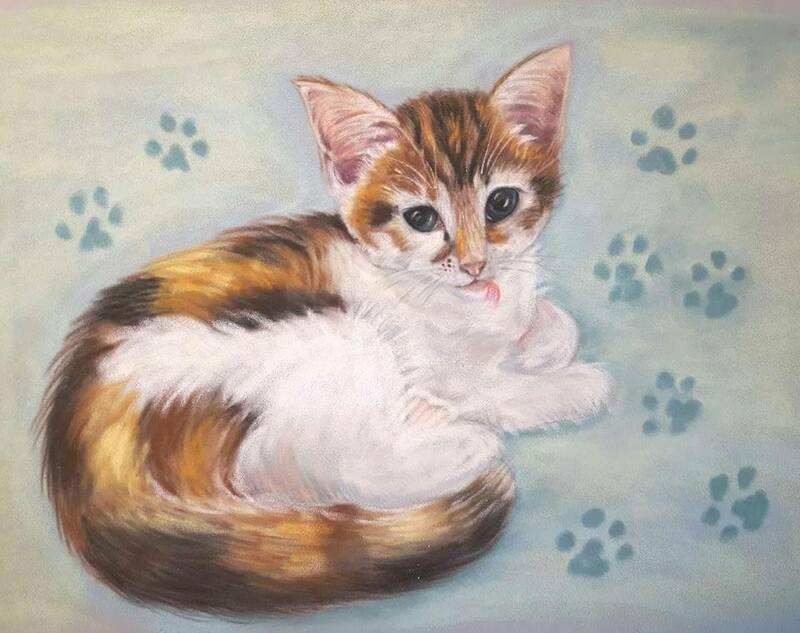 However, this will also depend on the personality and character of your cat and the presence you want the portrait to have in the room you decide to hang it. If you’d like me to paint a custom cat portrait, follow my simple 3 step guide: how to commission a portrait. Please send me a range of photos to choose from. It really helps me to get to know your cat’s personality and unique markings.